Gawad kalinga (GK) launched the”Gawad Kalinga, Kalinga CamSur” last September 30, 2012 at SM City Naga Event Center to promote welfare achievements and endorse the new partners of said foundation. The event was started by a colorful motorcade led by MPCF Band and Majorettes. Different representatives of GK communities from Triangulo, Del Rosario, Naga City, Libmanan, Ragay, Iriga and other parts of the region participated in. Performances of MPCF Band and Majorettes, CSPC Unity Dance and STI Dance Crew highlighted the event. Mr. Hayee Azaña, the Regional Director of GK CamSur gave his warmed welcome remark to all the VIP’s, sponsors and schools including MPC-Naga, Baao Community College, University of Nueva Caceres, STI, BISCAST(former CSPC-Naga) who joined on the said gathering. Mr. Bernie Prila-OIC at LGU, Princess Mancita-Volunteer, JR Montez-GK Youth Head, Diana Marie Rodrigo-Volunteer shared their lives before and after GK helped them and expressed their gratitude to the foundation. Afterwards, the MOA signing between the partner schools and the Gawad Kalinga as a proof of volunteerism in helping our community was led by Mr. Hayee Azaña, Dr. Mariel Estrella-ORES Director of MPC-Naga and Mr. Luis Oquinena along with the schools’ representative. With the unity dance and the singing of GK song, children expressed their appreciation to all the attendees. Junior Yellow Knights jigs made on top in the Cheer Dance Competition against 3 opponents during the last day of Intramurals, September 29, 2012 at the MPC Grounds. A comic style was the team’s strategy to capture the judges and audience’s eyes and became the latter’s edge against their opponents for their performance brought smiles and laughter’s, Darwin Opiana an ABC student leads the routines and do almost all of the comedy staff. His team, the Yellow Knights which was the 3rd year representative doesn’t exactly had an easy match against the others and it is obvious in the scores given by the judges who were Mr. Randy Cervantes, Ms. Julie Marivel, and Mr. Joebert Narvades which were 81, 87, and 88 for the Bluetwoth (2nd yr.), Red Pythons (4th yr.), and Green Leopards (1st yr.) team respectively as to their 89 score. It was a 7 minutes and two seconds presentation of the of 19 dancers and 6 props men in the cheer dance that also serves as a key for the victory of the Yellow Knights after being the over-all champion for this year’s intramurals having 25 gold medals. The cheer dance competition was the best way in ending the school’s intramurals with all the screams of the students supporting their own team representatives because it was always the most awaited and exciting event as to observed in the happiness of Mr. Erwin L. Recto who was the team manager that was then lift by the students because of their overwhelming happiness. Compiling a total of 54 medals – 25 gold 19 silver and 10 bronze , the yellow knights dominated and made it to become the overall champion in the recently MPC Intramurals held last September 26 – 29, 2012 at Mariners Polytechnic Colleges , Naga City. Students of MPC were divided according to year levels with their respective Team Managers from the faculty and staff– Juniors as the Yellow Knights (Team A) headed by Mr. Erwin L. Recto, Sophomore as the Bluetwoth (Team B) with Mr. Dominador Laure Jr., Seniors who are the Red Pythons (Team C) along with Mrs. Gloria B. Tapan and Freshmen known as the Green Leopards (Team D) accompanied by Mrs. Emee DC. Barbara. The Yellow knights won five championships in the following events; The Ms. Intrams , Basketball (women) , Volleyball (women) , Table tennis double (men) and got the big one which is the Cheerdance Competition. The Red Pythons trailed and become the 1st runner up having their 8 championships in 4 events such as Basketball (men) , Badminton single (men & women) , Badminton double (men) , Table tennis double (women) , Dart single (men) , Dart doubles (men & women). Pythons bagged 18 gold, 10 silver and 17 bronze making it to the second place and advancing to the Leopards just 1 gold. Green Leopards landed 2nd runner up accumulating six championships – Volleyball (men), Sepak Takraw, Table tennis single (men), Dart single (women), Chess (men), and Mr. Intrams. Leopards gathered 17 gold, 17 silver and 11 bronze. Green Leopards followed the Pythons with one gold lead bringing them to the third place. The Bluetwoth ranked last by achieving 4 gold, 13 silver and 23 bronze in the 3 championships events- Badminton double (women) , Table tennis single (women) and Chess (women) . As one of the highlights of the 2012 MPC Intramurals, the astonishing candidates of Mr. and Ms. Intrams had stolen the crowds attention as they stood out in the midst of the heat of the sun last September 26, 2012 at the MPC Quadrangle. The opening program started at exactly 7:00 a.m by a parade of school officials and students wearing their respective batch t-shirts with color distinction: green for freshmen, blue for sophomores, yellow for juniors and red for seniors. The route of the parade is from MPC going to downtown Naga and goes back to the campus. After which, the students gather in front of the JCJ Building for the awaited Search for Mr. and Ms. Intrams which sizzles up and serves as the tiredness remover not just for the students but to faculty and staff as well. As the candidates ramp on the stage, the audience supporting their bets and year level candidates can’t stop themselves to cheer. The competition is composed of the Production Number; Sportswear Attire; School Uniform Attire; and the Question and answer portion which really increased the heat in the place. The said undertaking was annually happening and sometimes the basis for the official candidates of school for others beauty and brain pageants. Seriously devastated residents of Rodriquez, Rizal were the beneficiaries of the very first SPS Operation Tulong last September 25, 2012. Carrying sacks of used clothings, groceries and minerals, Engr. Mario A. Agawin together with the two Administrative Scholar; Jay-Ar Arabaca and Roedan Nual headed to the place which is one of the most devastated areas because of heavy rains brought by Northwest Monsoon (Hanging Habagat). Over 300 families were benefited by the relief operation organized by different organizations like AKBAYAN Partylist and students of UP-Diliman. According to Arabaca, he was happy while distributing the donations collated from the different organizations of Mariners’ Polytechnic Colleges for it was his first time to see the glow in the faces of the hopeless people while receiving the donations. With their sacks of relief goods empty, the three representatives went home savoring the success of institution’s objective of helping even in such little way. “A run for education, democracy, social service and access to health”, as the Edsa People Power Naga Chapter (EPPNC) and Camarines Sur Council (CSC) conducted the first ever Edsa People Run with the theme: ” Isang Takbo ko, Sa Bayan Ambag ko!” last September 23, 2012 at Plaza Quezon, Naga City. A mass commenced as part of the activity at exactly 5:30 am at Metroplitan Cathedral with all the participants including MPC-Naga, SPJ Institute, STI, Bureau of Fire Protection (BFP), Naga City Police and Armed Forces of the Philippines (AFP) -Cam. Sur. Afterwards, the run started at the same place headed by the AFP-CS. A 5-kilometer runs from the Cathedral along the streets of Liboton, Magsaysay Avenue and Panganiban Road up to the finish line - Plaza Quezon. The induction of the new members of Cam Sur Council and distribution of certificates to all the participants immediately followed during the small program. The organizers decided to include the participants along with the City Mayor John Bongat in the shooting for their short video film entitled “Ako para sa Pilipino” which will serve as an eye-opener for all the youth as well as the Bicolanos. After the shooting, the EPPNC and the CSC went to the tomb of our late DILG Sec. Jesse M. Robredo at Eternal Gardens to offer a short prayer and to dedicate the said run to the late SILG and to the Filipino youth. Twelve (12) flair tenders from different schools in the Region participated in the Bartending competition in the very first Bicol Travel and Food Expo last September 13, 2012 at the Avenue Tent, Avenue Plaza Hotel. The competition was all about bartending, flairing or flair tending which is bartending with a show. Shaking the bottle and juggling it in the air with an alcoholic drink and mixing it with another liquid ingredient while grooving were presented to the judges. Each contestant showed their flair tending performances with their different acts. BSCA student Zurigue Vontroy Benito and BSHRM students Bryan Bulawan and Johnson Albis represented MPC Naga in the competition with their good and remarkable flair tending performances. They were supported by some MPCeans. However, Mark Obrero from USI won the Competition with the average score of 90.83 because of his all out performance. Participating schools were Mariners Polytechnic College Rawis, Unibersidad de Sta Isabel, SPJ Institute, CASIFMAS Ragay , Tanchuling College and Mariners’ Polytechnic Colleges-Naga. September 6, 2012 was one of the most remarkable day for Mariners’ Polytechnic Colleges- Naga Campus as they celebrated the ISO Certification Launching and MOA Signing at Doña Dolores Convention Hall 3, Villa Caceres Hotel, Magsaysay Avenue, Naga City with several respected guests from Naga and nearby towns in Camarines Sur as well. The said event started with a Thanksgiving Mass held at the MPC Grounds and was followed by the most awaited Launching and MOA signing conducted at Villa Caceres Hotel. “It’s been a dream for MPC to be ISO Certified, but with the hard works of the working committee for ISO and the hand in hand efforts of the employees that dream came into reality”, Dr. Gabriel LA. Jimenez said during his welcome address. Dr. Cely S. Binoya, Executive Director of Bicol Foundation for Higher Education and Director of Bicol Foundation for Higher Education and Director of Institutional Planning and Resource Generation and linkage at CBSUA congratulated Dr. Marilissa J. Ampuan for achieving the certification. Thus, she is now planning to have their school ISO certified and believed that they will also achieve it as what MPC-Naga did. A representative from SGS Philippines Inc., Mr. Roger S. Villanueva, Business Division Manager, Systems and Services Certification (SSC) took charged of the official turn-over of Plaque of ISO Certification to MPC-Naga which was received by Dr. Marilissa J. Ampuan together with Dr. Gabriel L. Jimenez, Ms. Maria Hazel O. Palacio, John Lazaro and the Jimenez Family. Dr. Ampuan stressed out that it was the greatest achievement for the school since it took 1 year and 5 months of evaluation, critiquing and review to realize the certification. 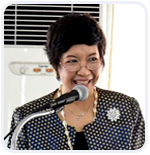 The wine toast was honored by Ms. Merly J. San Pedro, VP for Financial Affairs. Dr. Mariel R. Estrella, ORES Director facilitated the MOA Signing with partners; Hon. Emmanuel T. Prado, Municipal Mayor of Camaligan Cam. Sur, Hon. Rogelio Albo-Flores; Municipal Mayor of Milaor, Cam. Sur, Hon. William Abilay, Municipal Mayor of Gainza Cam. Sur, Mr. Philip T. Imperial, President of Metro Naga Chamber of Commerce and Industry, Mr. Harry Azana, GK Head for Camarines Sur & Mr. Sabas M. Mabulo, Executive Director of Kolping Society of the Philippines, Inc. MPC signed the MOA to connect with the grassroots, to rekindle its commitment and to build real partnerships. Ms. Maria Hazel O.Palacio, Quality Management Representative (QMR) closed the program by giving credits to the efforts of the ISO team and thanked everyone on their support to achieve the certification, with the challenge of Dr. Marilissa Ampuan which served as her strength to pursue on the goal of the school – to become “ISO Certified”. With the certification No. PH12/0761 valid until 2015, given by the SGS Philippines Inc., MPC-Naga desires to improve reliable and good quality standards to increase the productivity for the satisfaction of the stakeholders and clientele of Mariners’ Community.